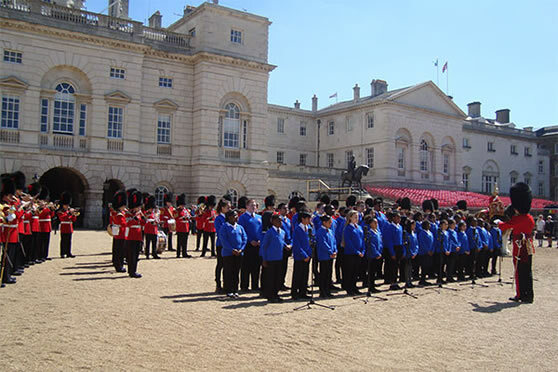 Key moments in the Commonwealth calendar, including the 2009 Diamond Jubilee of the Commonwealth, the 2012 Diamond Jubilee of HM The Queen and the Biennial Meetings of the Commonwealth Heads of Government, are marked in a highly visible way with major Commonwealth Youth Orchestra and Choir performances and recordings. 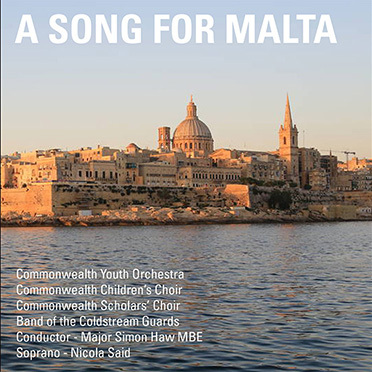 In April 2018 the CYO releases a special, non-commercial CD “A Song For Malta”, which has been produced, with the support of the Government of Malta, to mark and celebrate the Commonwealth Chair-in-Office 2015-2018, of the Prime Minister of Malta, The Hon Dr Joseph Muscat KUOM. International Women’s Day - HE Mrs Janice Charette, High Commissioner for Canada, hosted an event at Canada House, Trafalgar Square, London. Commonwealth Countries League - Commonwealth Heritage Event at South Africa House, Trafalgar Square, London. Speakers The Rt Hon The Lord Howell of Guildford and Dr Chris Nonis, former High Commissioner for Sri Lanka. British Museum - A performance to herald the meeting of the Commonwealth Heads of Government in London, April 2018. Featured music in these performances was "A Commonwealth Cantata in Six Parts - Earth Dance” by Simon Haw. This brilliant composition has been commissioned by the CYO to mark the occasion of the Meeting of the Commonwealth Heads of Government 2018. This special song, “To Be A Friend”, which is dedicated to Her Majesty The Queen, Head of The Commonwealth, has been especially commissioned by The Commonwealth Youth Orchestra and Choir to welcome the Commonwealth Heads of Government attending their biennial meeting to be held in London, April 2018. 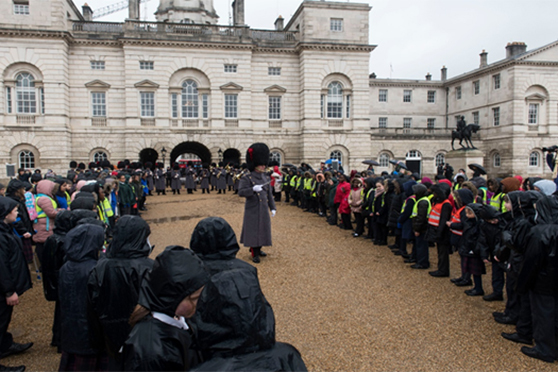 On Commonwealth Day 2018 at 12 noon, despite torrential rain, “To Be A Friend” was given its world-premiere performance, in Whitehall, London, UK, by 400 members of The Commonwealth Children’s Choir and The Band of the Coldstream Guards, conducted by Major Simon Haw MBE. The Commonwealth Youth Orchestra and Choir is honoured and delighted that The Rt Hon The Lord Mayor of City of London, Alderman Charles Bowman has become its new President. 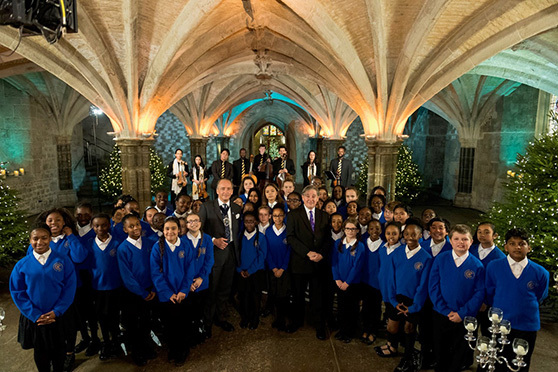 The Lord Mayor came to greet the children and musicians during the recording of 52 members of the Commonwealth Youth Orchestra and Choir conducted by Paul Carroll for the broadcast of The Queen’s Christmas Message 2017 in the East Crypt of Guildhall, London. The Commonwealth Youth Orchestra and Choir is hugely honoured to have been invited to perform on The Queen’s Christmas Message 2017. 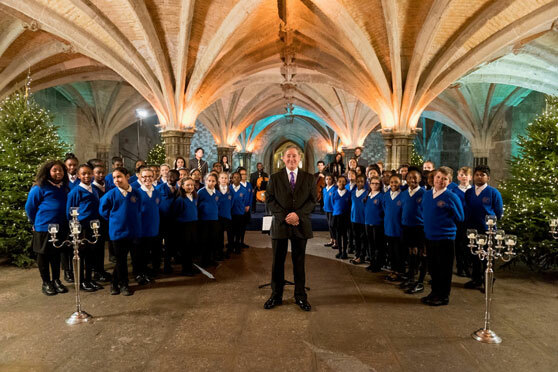 For this broadcast there were 52 children with Commonwealth Heritage singing in the choir and each child represented one of the 52 Commonwealth Nations. 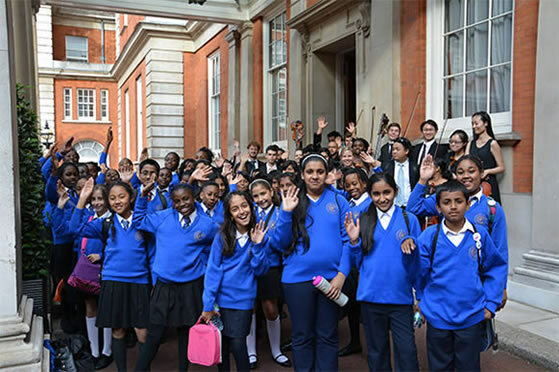 In The Queen’s Christmas Message 2017 the Commonwealth Youth Orchestra and Choir was mentioned as being a reminder of the “vibrancy of The Commonwealth”. The Coldstream Guards Band performed by kind permission of Major General B J Bathurst CBE, The Major General Commanding The Household Division. 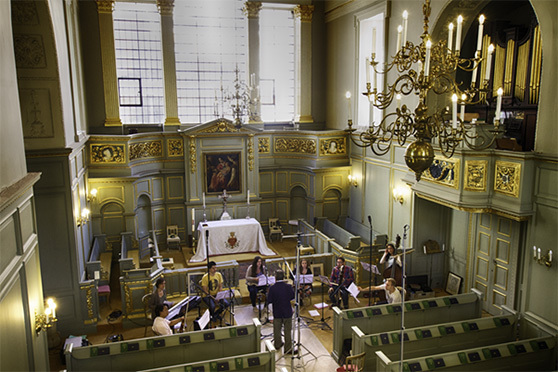 Recording in the Queen’s Chapel, St James’s Palace. 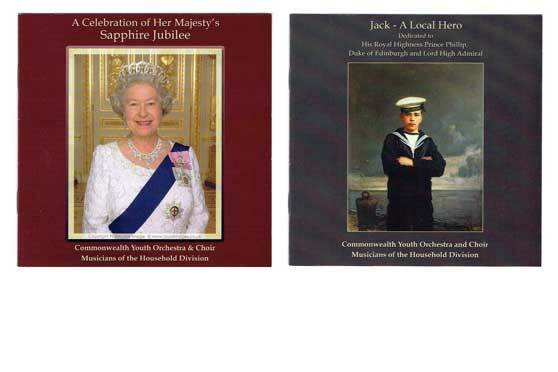 On 11 September 2016 the Commonwealth Youth Orchestra Soloists, conducted by Artistic Director Paul Carroll, were graciously given permission by HM The Queen to make a recording in the Queen Chapel, St James’s Palace. The music they recorded was “Nigeria” by Paul Carroll, a special commission by His Highness Prince Albert Esiri. "A Song For The Commonwealth", words and music by Commonwealth Music Ambassador Simon Haw MBE. Performed by 53 members of the Commonwealth Children’s Choir and Musicians of The Household Division. Recorded and Produced by Abbey Road Studios on 20 May 2016. 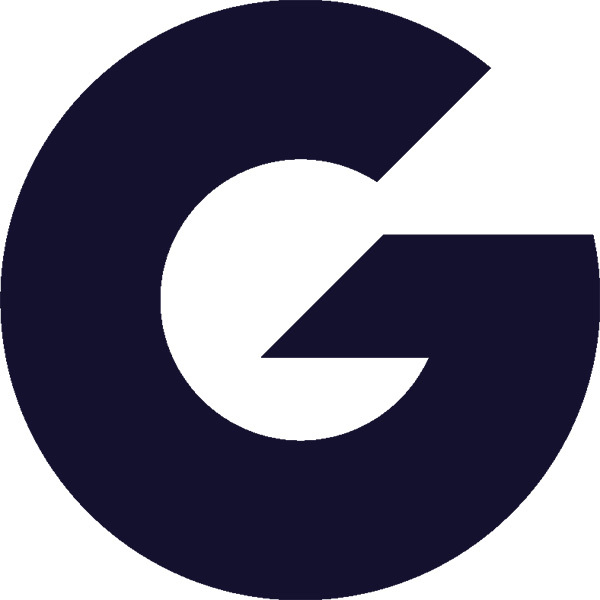 The Commonwealth Youth Orchestra & Choir, together with all its Commonwealth Orchestras and Choirs, Commonwealth Music Partners and Commonwealth Music Council, are honoured and delighted to announce that as of Wednesday 18th May 2016 it will have a new President. The Lord Marland of Odstock, having completed his two-year term as President, now steps down fromthat role. The Trustees and Executive are most grateful to Lord Marland for his support and enthusiasm over the last two years. The new President is His Highness Prince Albert Esiri.